I have a scary number of underwater images in the hopper – three trips’ worth, truth be told. I have been sharing a few on Facebook and Instagram (you can find me there – Judy G Diver), but I have been slow to mirror the images here on the blog. This is a little thread fin hawkfish, perched on pretty in pink soft coral. These skittish little fish (read: very frustrating to photograph) grow to a maximum of 3 inches in length. I captured this image at a depth of about 90 feet, on a muck site, in the Alor area of Indonesia. 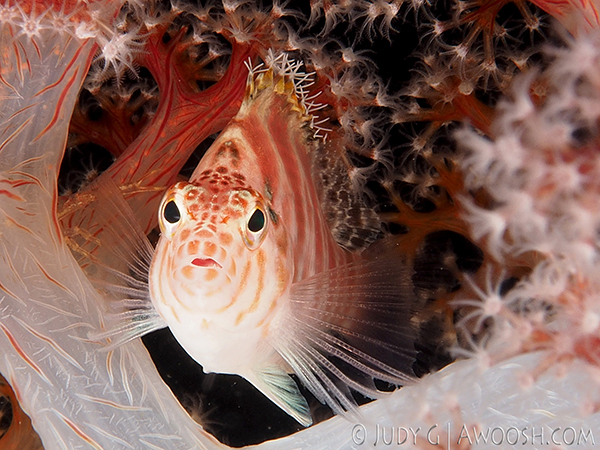 This entry was posted in Photography, Pic of the Day, Uncategorized and tagged Alor diving, Thread fin hawkfish. Bookmark the permalink.